George Bass was a ship's doctor who loved to sail the sea. In 1794 he joined the crew of the ship Reliance which was going to New South Wales. A new Governor, Governor Hunter was going to New South Wales to be the new leader of the colony. Matthew Flinders was a naval officer who also sailed to New Holland in 1794. On this voyage, George Bass and Matthew Flinders became good friends. A few weeks after arriving in New South Wales, Bass and Flinders set off for nine days to explore Botany Bay and the Georges River. They had a tiny boat which was called The Tom Thumb. Governor Hunter gave them a bigger boat which they also called Tom Thumb. They made several more journeys to discover the coast of New South Wales. Bass and Flinders made all these journeys in their spare time. 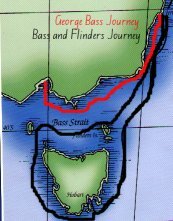 In 1797 Bass went on a three month voyage and sailed south along the eastern coastline to Westernport Bay and Phillip Island, near where Melbourne is today. Melbourne had not then been built. On the trip back to Sydney the crew were hungry and had to eat seals. They had to row for much of that journey home. At that time, people thought New Holland and Van Diemen's Land were joined. When Bass arrived back in Sydney, he told Governor Hunter that he thought there was a strait of water between the mainland of New Holland and Van Diemen's Land. Governor Hunter sent Bass and Flinders back in a bigger boat called "The Norfolk" to find out if this was true. Look at a replica of The Norfolk. Click the back button on your computer to return to this page! They set off in 1798 and found what is now known as Flinders Island. Bass and Flinders explored the north coast of Van Diemen's Land. In December, 1798 they sailed through the strip of water between New Holland and Van Diemen's Land and sailed round the island. Sailing round anything is circumnavigating it. Bass and Flinders circumnavigated Van Diemen's Land and arrived back in Sydney in January 1799. Governor Hunter and all people were very happy about the discovery. Before Bass and Flinders circumnavigated Van Diemen's Land, people had to sail around the south of the island to Sydney. Journeys could then be much shorter by sailing through the water between New Holland and Van Diemen's Land. The strip of water was later named Bass Strait. Between 1801 and 1803 Matthew Flinders circumnavigated the island of New Holland. Flinders suggested that the name of New Holland be changed to Australia. In 1817, three years after the death of Flinders, Governor Macquarie named New Holland - Australia. George Bass went back to England in 1800. He came back to Sydney in 1803. He left Sydney on the ship Venus in 1803 to sail to South America. Nothing more was ever heard of Bass. Look at an early map!